Italian cuisine is famous for its simplicity and variety with cheese and wine as major components of every Italian food recipe. It is also known for its pasta of different shapes, lengths, and widths and sauces with different ingredients. There are several different sauces used in Italian food and cooking. One is pesto sauce made from crushed basil, garlic, nuts, cheese, and olive oil. Then there is puttanesca sauce made from tomatoes, garlic, olives, anchovies, and red chilies. The most popular and widely used Italian sauce is Ragu which most people think as a tomato-based sauce but is actually a meat-based sauce with only a small amount of tomato sauce or paste added to it. 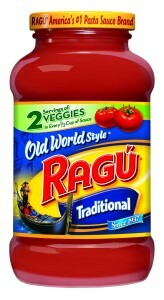 Ragu is a traditional Italian meat-based sauce that is usually served with pasta. It is prepared with ground beef that is simmered slowly until tender and can have several different condiments. A soffritto consisting of chopped onions, celery, carrots, and seasonings are added together with tomato sauce and other flavorings. Compared to other sauces it is thicker and made creamier by adding milk at the later stage of cooking. It has several different versions, and lamb, poultry, fish, veal, or pork can be used instead of ground beef. Other spices like chilies, peppers, beans, tarragon, and cumin can also be added. Ragu alla Barese is prepared using horse meat; Ragu alla Napoletana has a lot of tomatoes and uses red wine; Ragu alla Bolognese uses white wine and less tomatoes. Ragu alla Bolognese or Bolognese sauce is the most popular version of ragu. Bolognese sauce originated in Bologna, Italy and dates back to the 15th century. It is a pasta sauce that is meat based and contains a small amount of tomato sauce. It is traditionally served with tagliatelle, green lasagna, and other wide-shaped pasta instead of spaghetti pasta because the sauce holds up better with wider pasta. Its ingredients include beef, soffritto, pancetta, onions, tomato paste, meat broth, white wine, and cream or milk. Like all other food preparations, Bolognese sauce has different variations. Pork, chicken, veal, rabbit, goose, and other meats can be used instead of beef. The soffritto is made with celery, carrots, and onions cooked in butter or olive oil. Mushrooms, ham, and sausage are also added together with milk or cream to add more flavors and give it more creaminess. It is usually simmered for at least five hours. 1.Ragu is a meat-based Italian sauce that is served with pasta while Bolognese sauce or Ragu alla Bolognese is a variation of ragu. 2.Ragu is thicker than other sauces, and while other variations of ragu such as Ragu alla Napoletana use red wine, Bolognese uses white wine. 3.Other ragu sauces use it for spaghetti pasta, but Bolognese uses it with wider-shaped pasta like lasagna because the thick sauce blends better with wider-shaped pasta. 4.Ragu and Bolognese taste better when cooked for as long as five to six hours. Emelda M. "Difference Between Ragu and Bolognese." DifferenceBetween.net. December 30, 2016 < http://www.differencebetween.net/object/comparisons-of-food-items/difference-between-ragu-and-bolognese/ >.